Greenleaf Book Group Press, 9781626340510, 371pp. CAIRO, EGYPT 1941. As the Second World War rages, the city known as "Paris on the Nile" plays host to an international set who seem more interested in polo matches and swanky nightclubs than the Germans' unrelenting advance across North Africa. Meanwhile, as refugees, soldiers, and spies stream into the city, the Nazis conspire with the emerging Muslim Brotherhood to fuel the Egyptian people's seething resentment against their British overlords. Ambitious American journalist Mickey Connolly has come to Cairo to report on the true state of the war. Facing expulsion by the British for not playing by their rules, he accepts a deal from the U.S. embassy that allows him to remain in the country. His covert mission: to infiltrate the city's thriving Jewish community and locate a refugee nuclear scientist who could be key to America's new weapons program. But Mickey is not the only one looking for the elusive scientist. A Nazi spy is also desperate to find him--and the race is on. Into this mix an enigmatic young woman appears, a refugee herself. Her fate becomes intertwined with Mickey's, giving rise to a story of passion, entangled commitments, and half-truths. 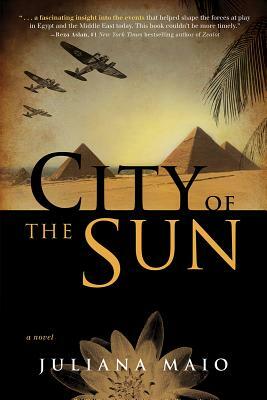 Deftly blending the romantic noir of the classic film Casablanca with a riveting, suspenseful narrative and vivid historical detail, City of the Sun offers a stunning portrayal of a time and place that was not only pivotal for the war, but also sowed much of the turbulence in today's Middle East. Juliana Maio was born in Egypt but expelled from the country with her family during the Suez Crisis. She was raised in France and completed her higher education in the United States, receiving her B.A. from the University of California, Berkeley, and her Juris Doctor degree from UC Hastings. Juliana is the co-founder of Lighthouse Productions, an independent film and television production company, with her husband, Academy Award winning film producer, Michael Phillips. She is also a published novelist, a screenwriter, and a television series creator. Prior to co-founding Lighthouse, Juliana practiced entertainment law for twenty-five years and also served as a studio executive.